I you ever wondered how email gets from here to there watch this short video. If you never did wonder about that, watch it anyway. It's fun. A Starbucks latte option is 'extra foam.' It makes your drink more like a cappuccino, but with out the cinnamon. 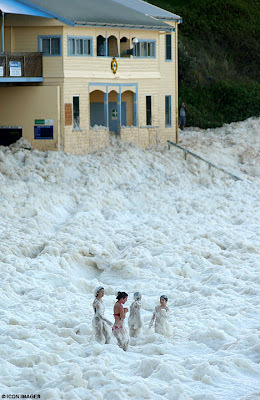 The folks at Yamba, Australia, near Sydney had foam with their water recently. In fact, their whole beach and many of the nearby buildings were swallowed by the stuff. It was created by just the right combination of salts, chemicals, dead plants, decomposed fish and seaweed churned up by powerful currents. Storms off the New South Wales Coast and further north off Queensland created a huge disturbance in the ocean, hitting a stretch of water where there was a particularly high amount of the substances which formed into bubbles. 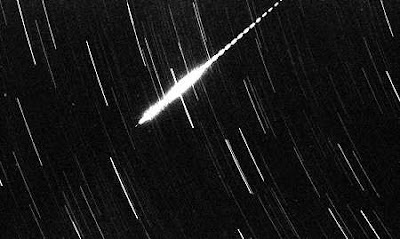 On Friday night/Saturday morning, August 31/September 1, there will be an outburst meteor shower. An outburst is a sudden, short burst of a lot of meteors, Aurigids in this case. This is debris left over from the 2000-year-period comet Kiess, and the Earth doesn’t pass through the meteor stream very often so they're very difficult to predict. But the best guess just now is that there will be about 200 meteors visible per hour at the peak -- but the peak comes at 4:36 AM Pacific Daylight Time, which means that it won't be visible from anywhere but the western United States and Hawaii. In the Dimensional Change Card sorting (DCCS) task, 3-year-olds can usually sort cards successfully by a first rule - whether by shape, color, size, etc. When asked to switch then to another rule, most 3-year-olds will perseverate by continuing to sort cards according to the first and now-irrelevant rule. This occurs even when the current rule is repeated every single time they're asked to sort a card! Children will even correctly repeat the name of the rule they should be using, and then proceed to actually sort the card by the old rule. By age 4, however, most kids are able to successfully switch to a second rule (though many will still have trouble when asked to switch again). What then changes between 3 and 4 to allow this shift away from a remarkably strange behavior? 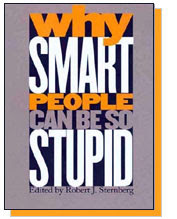 A new study by Wolfgang Mack begins to answer this question. TED (Technology Entertainment Design) is an annual conference held in Monterey, California. TED describes itself as a "group of remarkable people that gather to exchange ideas of incalculable value". Take a look at the speakers/performer list. Lectures, music, dance, comedy...in a sense many of the best of humanity's thinkers, performers, and builders of tomorrow. 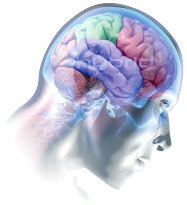 Jan Goodall-chimpanzees, Jeff Bezos-Amazon, Martin Rees-cosmology, Rev. Tom Honey-religion, Bono - music (U2), Steve Jobs - Apple, and the list just goes on and on. An espresso has less caffeine than a cup of coffee! A cup of brewed coffee has about 110 milligrams of caffeine, and potent as it may seem an espresso about 80mg. But of course that's based on volume; 8 ounces for a cup of coffee and 1.5 oz for espresso. Drip coffee has about 13mg/oz., espresso has a whopping 51mg/oz, and instant decaf only has .31mg/oz. A can of Coca-Cola has about 23mg of caffeine, Pepsi Cola 25mg, Mountain Dew 37mg, and TAB 31mg. A cup of tea has about 40mg of caffeine, while an ounce of chocolate contains about 20mg. This all comes up because I'd had a hard time concentrating lately. I'd be jumping from webpage to webpage, back to email, over to Flickr, back to email, check out the news, and and and . . . .
Actor Stephen Baldwin, the youngest member of the famous Baldwin brothers, is no longer playing Pauly Shore's sidekick in comedy masterpieces like Biodome. He has a much more serious calling these days. Baldwin became a right-wing, born-again Christian after the 9/11 attacks, and now is the star of Operation Straight Up (OSU), an evangelical entertainment troupe that actively proselytizes among active-duty members of the US military. As an official arm of the Defense Department's America Supports You program, OSU plans to mail copies of the controversial apocalyptic video game, Left Behind: Eternal Forces to soldiers serving in Iraq. OSU is also scheduled to embark on a "Military Crusade in Iraq" in the near future. "If we could shrink the earth's population to a village of precisely 100 people, with all the existing human ratios remaining the same, it would look something like the following. . . ."
It goes on to claim, among other things, that if the worlds population is represented by 100 people "1 would own a computer." That means there are only 0.01*6.6 billion or 66 million computers out there? Actually, in 2003 62 million US households alone had a computer, and many have more than one according to US Census Bureau.